2 Unfortunate 2 Travel is a show by and for bleeding heart B.A. liberals raised on pop-culture. This devised work by director and adaptor Zach Weinberg takes Thomas Nashe’s novella The Unfortunate Traveler and brings the tale of a young man exploring the world into the post-Trump era. 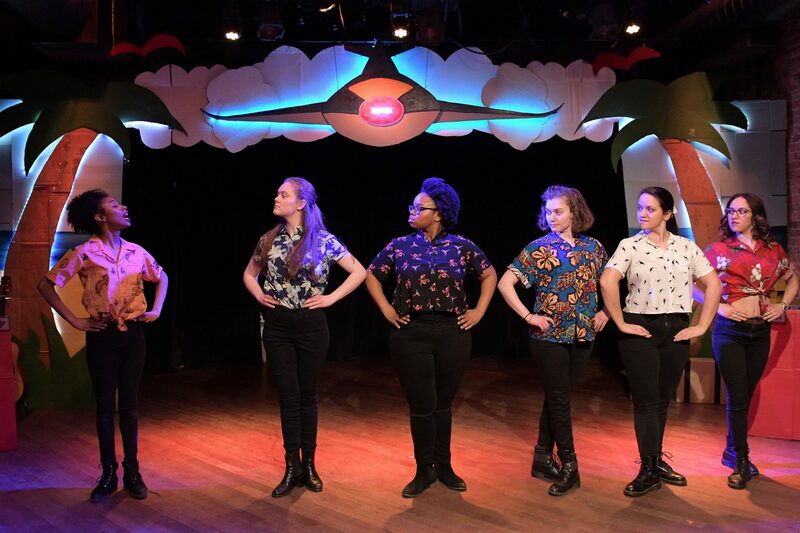 In this adaptation, protagonist Jack Wilton wants to relive his exploits across the globe through a variety show featuring a skilled group of women. Prop Thtr’s production of 2 Unfortunate 2 Travel caps off a 2-year workshop period and clearly wants to start a conversation. Despite several stand-out moments, the play leaves me more confused than conversive. The 2016 presidential election is the catalyst for the play. Although Jack Wilton’s travels are instigated by the election of our 45th president, the issues surrounding privilege go much further back. But this isn’t some Ted Talk to lecture you on privilege, it’s a variety show and variety shows are supposed to be fun! 2 Unfortunate 2 Travel has puppetry, step, song, stories, and games. Jack Wilton (Joseph Ramski) is some sort of Ed Sullivan meets Dean Martin host who orchestrates the evening’s entertainment. The ensemble of six women sit on the sidelines until they are invited up to share another episode of Wilton’s travels through their personal talent. The audience is very well behaved. They cheer when told and jump to participate in silly games for the chance to win a free beer. The storefront theatre has a low budget and uses that to its highest benefit. The lovingly DIY quality of the set resembles a public-school auditorium. Most everything is made from cardboard. The colorful proscenium depicting a sandy beach is a major feature of the clever set by Melissa “13andit” Schlesinger. This is complemented by an entirely cardboard interactive gift-shop created by Nina D’Angier in the theater’s lobby. Lighting design by Benjamin Carne shares in this style with a combination of traditional lighting equipment and fairy lights wrapped above the stage. Everything is warm and inviting until it isn’t. Every so often the world sickens and the lighting drops to dark seclusion. Suddenly, Morgan Hunter’s sound design brings us back to play with an upbeat shorthand to inform the audience that everything is okay. It’s better than okay! Joseph Ramski is charming as the evening’s host and figurehead. There’s a persistent excitement that radiates off him which makes his role as host naturally entertaining. The true stars, however, are the women who carry the actual performance. Once I see what they have to offer, I’m radically less interested in what Jack Wilton has to say. In fact, I’ve never been interested in hearing about how some rich white guy found himself abroad. It’s tired and I’ve heard it all before. I am much more interested in how Lilly (Zoë DePreta) slays at flip-cup, or how Aaron (Schanora Wimpie) can step her way out of an Irish Pub brawl. The joint storytelling ability of these women far exceeds the charisma of one man. When I go up to participate in one of the evening’s games, I gravitate toward Rita (Taylor Wisham). She makes me feel safe and supported like we’re old friends even though we haven’t spoken. Then Jack checks in with me, and I’m surprised because I had completely forgotten he was there. Jack Wilton is increasingly ridiculous as a concept. He regularly re-appears in absurd blazers, the last of which is a gold glittering number that transforms Joseph Ramski into a human disco ball during his final monologue turned rant. This entire time he has been trying to separate the personal and the political. That is ridiculous. Any individual familiar with the foundations of feminism would tell you, “the personal is political.” This statement, a cornerstone of second-wave feminism, asserts that personal experience is intrinsically connected to larger social/ political structures. To be aware of this is not enough, you also must practice what you preach. This is where 2 Unfortunate 2 Travel derails from its mission to confront privilege. With such a focus on duality, Prop Thtr is trying to have its cake and eat it too. This muddles the message. I’m left with a feeling of confusion that keeps me from taking a deep dive into the kind of conversations this production was hoping to engage. Frankly, I don’t get the point. 2 Unfortunate 2 Travel runs at Prop Thtr until April 15th.